The. Shakespeare Birthplace Trust is celebrating the 450th birthday throughout the Shakespeare family houses and the streets of Stratford. What better place to celebrate Shakespeare’s 450th birthday than the house he was born and grew up in! Visit Shakespeare’s Birthplace and add your name to our visitors book to create a lasting record of the people who helped us to celebrate this milestone anniversary. 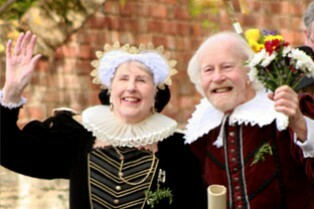 Dress up as a Shakespearian actor with hats, cloaks and props and have your photograph taken at Shakespeare’s Birthplace. The photos will be posted on our facebook page so that you can share them with your friends. Learn about midwifery in Tudor times with our fascinating 10 minute talks in the Birthplace cafe every hour from 10am-4pm. Normal admission applies so existing ticketholders can celebrate with us for free! To launch ‘Singing Shakespeare’, a new global project celebrating choral settings of Shakespeare’s works, the Shakespeare Birthplace Trust is proud to present a special concert to be held in HolyTrinityChurch, Stratford-upon-Avon. Featuring the world premieres of three brand new and innovative choral settings by award winning composer Gary Carpenter, a setting of Stephen Sondheim’s ‘Fear no more’ in a new arrangement by David Wordsworth, artistic director of Singing Shakespeare, who will also conduct the combined choirs and soloists from the Birmingham Conservatoire in a performance of Vaughan Williams’ ‘Serenade to Music’. Godiva’s Odyssey, part of the 2012 London Olympiad, will be in Stratford-upon-Avon from Friday 25 – Saturday 26 April. The 20ft mechanical figure will be sleeping over on Henley Street on Friday night, sharing stories and exploring the role of women in Shakespeare’s works. On Saturday 26th she will join the birthday procession through Stratford before spending the afternoon in BancroftGardens. Don’t miss this incredible spectacle! Join Michael Bogdanov as he talks to Paul Edmondson about his illustrious career directing Shakespeare which spans more than 40 years. During this time he has always tried to be cutting-edge, often controversial, and believes in performing Shakespeare in modern-dress. In his view this makes the plays more relevant to our own times and allows us to see more of ourselves in them. The Shakespeare Birthplace Trust was delighted when Michael Bogdanov deposited a wonderful cache of papers in our archive to sit alongside the archives of the RSC and to show how differently Shakespeare can be performed. Some of these items will be on display at the Institute before the lecture begins. Tickets cost £10 and are available to purchase online or at any of the Shakespeare family homes. Sit back and relax as our resident troupe of actors, Shakespeare Aloud! bring Shakespeare’s complete works to life in just two hours – phew! What better place to celebrate Shakespeare’s birthday than in his GreatGarden. Bring a picnic along and add your handprint to our exciting plans for a new New Place. Bring a picnic and enjoy free entry to the gardnes at Hall’s Croft. There’ll be entertainment, birthday cake, dressing up and prizes for the best Knight and Nymph. On 26th April, the Shakespeare Birthplace Trust, working with performers and community groups from Stratford upon Avon and beyond, will be presenting the People’s Pageant and free entertainment throughout the town centre. Immediately following the Procession, Godiva, our special guest, will lead the People’s Pageant along Bridge Street, High Street, Sheep Street and onto the BancroftGardens, where she will spend the afternoon being entertained by a host of performers. The Pageant includes representatives of local, regional and national arts and community organisations – from the Shakespeare Hospice to the regional Bangrha band. Expect colour and music as we start the people’s birthday party! Throughout the afternoon, the BancroftGardens, Henley Street and Cornmarket will host performances by groups including the Stratford Concert Band, Swan Tai Chi, Someone at the Door Samba band, the 1623 Theatre Company, The Wayfarers, All Strings and Things, The Stratford Renaissance Dance group and students from Stratford Music Centre. Choirs, dance, music and theatre – and all free! Watch out for our photographers who will be taking your portraits all afternoon – and our bloggers who would love you to share your experience here in Stratford with them and the world!